DO-17090-31 was succesfully added to your cart. We can calibrate all styles of pressure and vacuum equipment including analog/dial gauges, digital gauges, transducers and transmitters, pressure calibrators, manometers, barometers, deadweight testers, and pressure comparators. InnoCal services all major brands of pressure equipment including Ashcroft®, WIKA®, Crystal Engineering, Fluke®, Druck, GE Sensing, Cole-Parmer®, Extech®, 3D Instruments™, and many more! All calibration certificates contain as-found and as-left data, estimated measurement uncertainties (emu’s), and test uncertainty ratios (TUR’s) at no additional cost! All measurements reported are traceable to SI units via national standards maintained by NIST and performed in compliance with ANSI Z540, ISO17025, and MIL-STD-45662A. 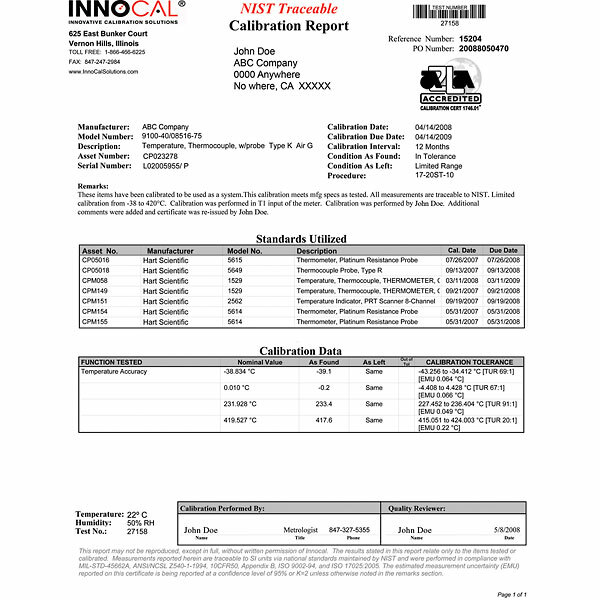 InnoCal is accredited to ISO/IEC 17025 by the American Association for Laboratory Accreditation (A2LA) under certificate number 1746.01. This accreditation is your assurance that the calibration is performed in a qualified, controlled laboratory.Calibrations on manometers are performed using ultra-precise quartz pressure reference transducers and reference manometers. Measurements are taken at 5 points across the range of the instrument. The calibration services are top notch and very user friendly. The only negative comment I have is that turnaround can be improved.